​"teen titans go! To the movies"
THE STORY - It seems that all the major superheroes out there are starring in their own movies, all but the Teen Titans. Robin is bound and determined to remedy that situation by becoming a star instead of a sidekick. With a few madcap ideas and a song in their hearts, the Teen Titans head to Hollywood to fulfill their dreams. Things soon go awry, however, when a supervillain plans to take over the planet, putting the very fate of the young heroes on the line. ​​​As film lovers are inundated with hordes of superhero films of varying quality, a new subgenre has begun to rise to the top: irreverent superhero films. With “The Lego Batman Movie” and “Deadpool” and its sequel, audiences are eating up films that wink at the tropes and inside jokes that accompany these lighter films. “Teen Titans Go! To The Movies” throws its hat into the ring, bringing plenty of the same sarcasm and self-referential humor. 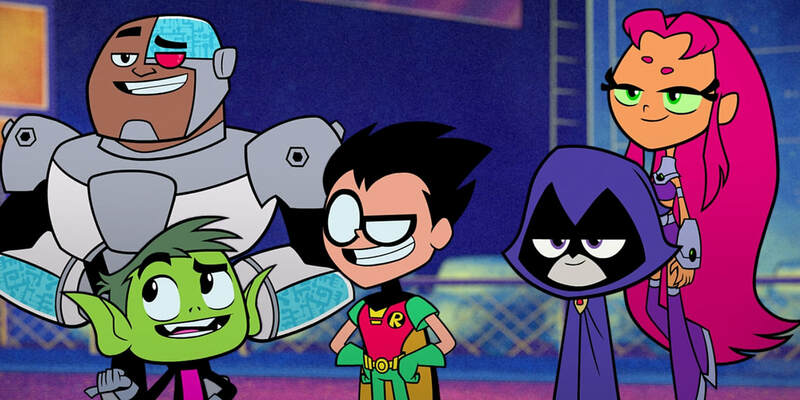 This adaptation of the Cartoon Network series “Teen Titans Go!” (Which this writer has never seen) finally shows us the lighter side of the DC Universe on the big screen. The Titans are the underdogs of the superhero landscape, too young (and too goofy) to be taken seriously as crime fighters. Beast Boy, Cyborg, Starfire, Raven, and their de facto leader Robin find themselves wanting to prove themselves to the rest of the heroes. They watch from the outside as hero after hero is given their own movie, and Robin is desperate for his own film. For older viewers, the wit hits all the right notes. The film opens with the flipping pages of a comic book, a sight that looks eerily similar to Marvel’s title sequence. Of course, it zooms out to show someone simply reading a comic book. It sets the tone immediately: they’re familiar with all the same cinematic universes you are, and it’s not afraid to poke fun at them. They make “Deadpool” jokes, the obligatory “Green Lantern” jokes, and many more that really work, assuming the viewer is familiar with the superhero genre. One of the greatest gags in the film revolves around Stan Lee cameos. On the other hand, there are plenty of elements crafted simply to make little kids giggle. There are plenty of fart jokes and silly dancing that will surely land for the younger viewers. And there’s nothing wrong with that! It just doesn’t feel balanced in appealing to a wide age range like Pixar or Disney films. There’s an entire scene (With accompanying song!) based around pooping in a prop toilet. “Teen Titans Go! To The Movies” actually has a number of songs throughout the film, including a supremely catchy Michael Bolton tune “Upbeat Inspirational Song About Life” (That’s conveniently reminiscent of 'Everything Is Awesome' from “The Lego Movie”). The Titans, well, mainly Robin, seek to find an arch-nemesis who would make their story worth a Hollywood film. Slade (Will Arnett) soon crosses paths with them as he attempts to steal a crystal “convenient plot device.” Robin becomes determined to make Slade the team’s arch-nemesis, proving to famous Hollywood director Jade Wilson (Kristen Bell) that they’re feature film material. There’s not much of a deeper level to “Teen Titans Go! To The Movies.” It’s cute, it’s often very witty, and it’s a nice sendup of superhero movies far and wide. Adults will laugh quite a few times here and might enjoy seeing a different side of the often dark and drab DC superheroes. Still, in the end, it’s a movie aimed more at the elementary crowd than anything else. Or maybe, and this is a distinct possibility, I just don’t laugh at poop jokes as much as the next guy.